Brent Malin begins his album with a thunderous phrase uttered by no man ever before or since: I think I'll stay in Pittsburgh for a while. Ha. Sorry. Maybe I should leave the comedy to the comedians. 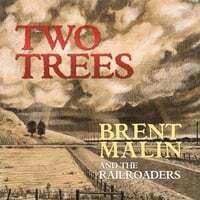 Malin's second album, Two Trees, is good, wholesome roots rock'n'roll. His delivery is Zevon, but the lyrics are pure Mellencamp: straight-talking, down-to-earth, and rich with story. It's hard for me to pick out any particular song on this album; they're all pieces that Malin has every right to be proud of. "The Gambler" manages to draw heavily from card-playing metaphors, but successfully avoid cliche. "I Don't Miss You When You're Gone" is as excellent a breakup song as any. If I had to choose, though, the title track, "Two Trees," is probably my favorite. It's honest and personal, and it's a stark reminder that life is long and worth the ride.